The Ninja Gaiden series is one with quite a reputation about it. It is known for being very gory, its futuristic ninjas, and, of course, for being incredibly difficult. Oh and also the ninjas? So when Ninja Gaiden 3 was available, I had to check it out. The rough explanation of the story is that the world, yet again, is in mortal danger that only Ryu Hyabusa can save it from. However, unlike Ninja Gaiden 1 and 2, hellish fiends and Archfiends are not anywhere to be found in this game. Instead, a new enemy, the alchemists, is introduced. Ryu also receives a nasty, disfiguring curse to his right arm in the end of the first mission that causes some problems within the game. The first thing I would like to address about this game is the fact that it is no longer the challenging blood fest that it once was. Where the previous games required an amount of skill to get anywhere, Ninja Gaiden 3 can be beaten with not much more than an occasional dodge or block and constant button mashing. I also have rather fond memories of maiming some particularly annoying enemies in gruesome ways in the previous game, but this game has pretty much eliminated that aspect completely. Why they did this I have no idea, but the animations of the sword cutting through enemies, with the enemies remaining intact, subtracts from the experience somewhat. It made it feel like the game was brought down to cater to children. Visually, the game was not really an improvement, but it didn’t get worse. I was a little disappointed that they didn’t improve the looks much, but since they don’t look terrible, I didn’t think that it was much of an issue. One thing I found to be extremely disappointing was that, in Ninja Gaiden 2, Ryu was given a great variety of weapons to choose from with their own unique way of fighting, but in Ninja Gaiden 3 everything other than using a katana is downloadable content. I find that to be a little insulting. Why should I have to pay more for something that was free in the last game? It just seems like a slap to the face to the people who loved using different weapons in Ninja Gaiden 2. I have to admit that I was not looking forward to playing the new multiplayer feature of this game. I was expecting just a “thrown together” multiplayer like some other recent video games have started to do. The first problem I had when trying it out was that I had to download a code and a multiplayer pack from the market place. They were free, but why wouldn’t it just be in the game? After getting past that twenty or so minutes of downloading, I gave the challenge mode a try. It was disappointing to say the least. It was pretty much fighting battles from the campaign with the help of a buddy. If I had to do it myself, what is the value of adding another man to it? The “clan battle” mode was pretty good though. It is not balanced with people of higher level and those that bought other weapons DLC, but there are still ways to get around that. I found it to be unexpectedly entertaining. All things considered, I would have to say that this game is mediocre at best. The gameplay was not that challenging, multiplayer was disappointing, the story was not good and the whole thing made feel like it was rushed. 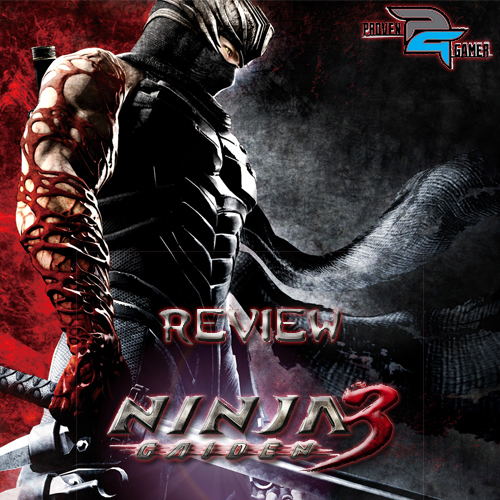 I have to give Ninja Gaiden 3 a score of 3 out of 5.